Everything you say, according to Mary Shores, is either creating a bigger connection or driving a disconnection. Words have the power to transform lives. Mary is an award-winning author, speaker, and entrepreneur who teaches step-by-step how to harness the power of our words to rewire our minds and create deeper connections with others. On this episode of The TalentGrow Show, Mary and I dig into the three rules and three steps that make up her strategy called Words That Work. Along with lots of other juicy insights, you’ll learn which six trigger words you should just remove from your vocabulary and what to replace them with! Mary also talks about the Core Four process she developed to stay focused and productive in situations when your stress level threatens to get high, and how to use action statements to earn the trust of whomever you’re speaking with. Listen and don’t forget to share with others! Mary is a best-selling Hay House personal development author, and a businesswoman who discovered a roadmap for how to get in control of your own life. As the owner and CEO of what has been called one of the most unique collection agencies in the country, her philosophy of maintaining a positive approach to life and to debt collection has re-framed her entire organization and the lives of those she’s trained. Grab your Daily Desires Diary Bundle gift! Watch the Brené Brown video about empathy that Halelly and Mary talked about! Mary: Anytime you hear the word “unfortunately,” there’s just no good news. Halelly: That’s true. I really don’t like that. Mary: I know, and as soon as you hear it, that adrenaline, that cortisol, starts to pump through your body because you’re bracing yourself for bad news. Well, what happens, let’s say the manager or whoever is doing the speaking, when you consciously remove the word “unfortunately” from your language, what happens is it triggers the strategic thinking centers of your brain and you end up coming up with solutions that you would have never thought of before. Halelly: Hey there TalentGrowers. Welcome back to another episode of the TalentGrow Show. 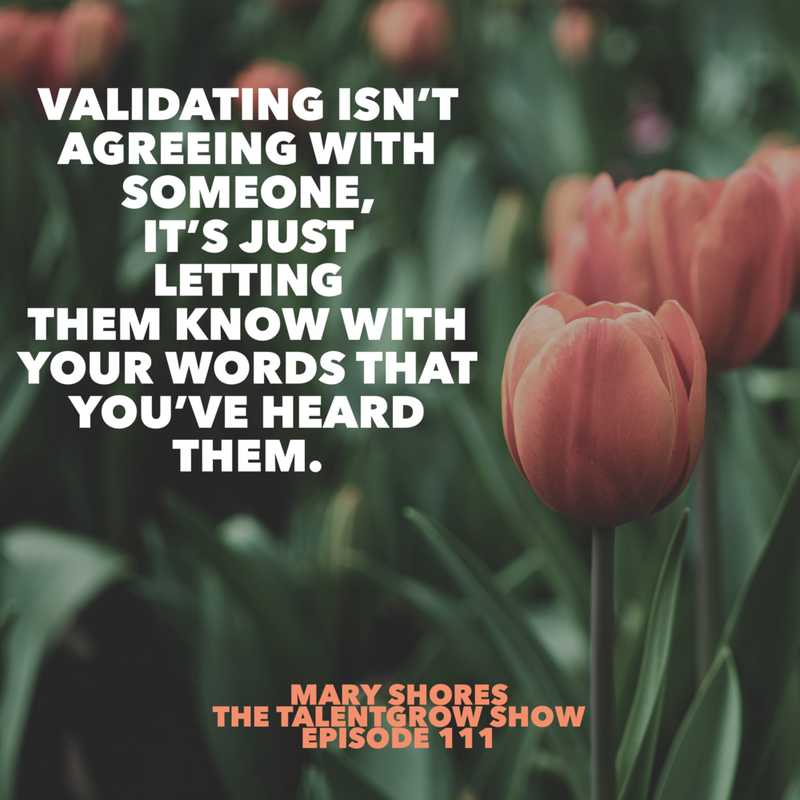 I’m Halelly Azulay, your leadership development strategist here at TalentGrow, and this week we have author Mary Shores. She’s also a successful CEO for the past 20 years. She has built a business and she has a lot of insights to share about how your communication can really change the results that you see. You know that I really enjoy talking about communication. She describes how there are certain words you shouldn’t say, and certain words and phrases that you should, and why. We also talk about three steps to making your words work better for you, and also something she calls the core four, which is essentially a way to help you focus on essential priorities. 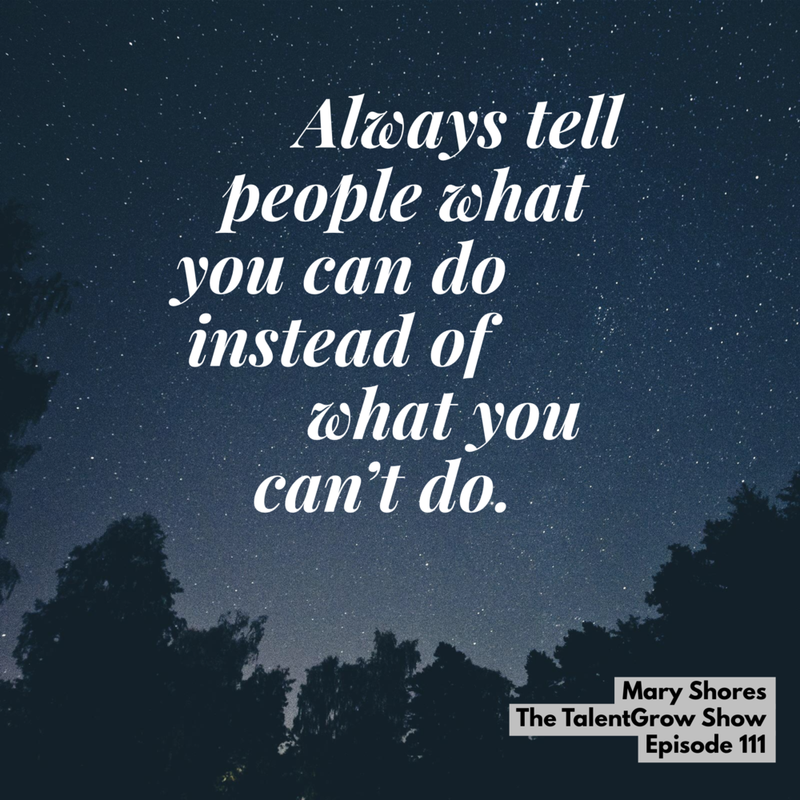 Without further ado, let’s listen in to my conversation with Mary Shores on the TalentGrow Show. Okay, TalentGrowers. This week I have Mary Shores, the author of Conscious Communications, a step-by-step guide to harnessing the power of your words to change your mind, your choices and your life. She’s also CEO and President of Midstate Collection Solutions, a leading debt collection agency she founded 20 years ago, which now has over $40 million in revenues and over 25 employees. Mary has spent over a decade teaching businesses and individuals how to identify their goals, create new ways of thinking and take action to create meaningful results. She’s been featured on local and national radio and television shows, lots of podcasts – including this one now! – and blogs. Mary, welcome to the TalentGrow Show. Mary: Halelly, it is so absolutely wonderful to meet you. Halelly: I’m very happy to meet you and I appreciate that you’ve taken time to spend a little bit of time with us, the TalentGrowers, so that we can learn from your wisdom and insights and experience. But before we go there, I always ask my guests to describe their professional journey. Where did you start and how did you get to where you are today? Mary: I love that question. I often say that my professional journey has not at all been a graceful one. As a matter of fact, it’s been super uncomfortable at times, and a lot of that is just because I did not necessarily have the most ideal situation growing up. I was out on my own at 16 and still managed to graduate high school, but I had a daughter who passed away very young when I was only 20. Mary: I went through this experience in life where I spent about a year and a half living in and out of the children’s homes. What happened after that, after she passed away, I felt a little behind my peers, if you know what I mean, because at this point my friends were graduating college and they were beginning their careers. I would love to tell you this super empowering story, but that was not me. My story was a little more difficult. That’s okay, because it built a certain amount of character and resilience in me, and then I realized that I wasn’t going to meet my goals if I just tried to get jobs. That’s when I made a decision to start my own business. Halelly: Wow, I mean, really, seriously that is a very difficult kind of journey. Many of us have difficulties along the way, but in comparison to those decisions and those experiences, at that age, I would say that probably most of our experiences seem like butter in comparison. I’m very sorry that you experienced that, but I do agree that you probably are now teaching others how to be resilient as a result of the resilience that you built through that. Mary: Oh yes, thank you so much for that acknowledgement. It was definitely a difficult time in life and I bring it up because I feel like, in a lot of ways, I could have become a statistic and I didn’t. Over my 20 years as a CEO, I’ve learned so much and I’m always happy to give that knowledge to other people. Halelly: You’ve been doing that for a while now, so that’s also very interesting. People who listen to this show know that I’m always so intrigued by people who have kind of multi-lane careers, I guess you could say. Where you’re pursuing your business that you’ve built and leading that and allowing it to continue to be successful, and at the same time you’re pursuing this side hustle, if you will, of writing a book and teaching people and doing workshops and showing up on media interviews to share your insights and knowledge. Those are two very different things. Each of them requires a lot of effort and so you’re successfully managing to do all of that at the same time. Any tricks to how you make that happen? Mary: First of all, I’m thrilled that you even notice that about me, because I think that you just very elegantly described something that for other people can be very confusing. One of the things that I love to talk about, and I think that is really great for your audience, is managing communications, so we can get into that. That’s something I’ve taught for many, many years. The reason I think it’s so great that you bought it up is because your audience might be confused – why is this debt collector woman on the show? Halelly: We’re probably not going to talk about that too much! Mary: But it is an important topic, because here’s a thing about debt – when people own a debt, it will cause a feeling of shame and unworthiness and people are statistically not going to apply for the same jobs, they may feel held back to apply for a mortgage and even some people won’t date the same people or have the same level of friends because there’s this underlying feeling of shame and unworthiness associated with even having a debt. So, right away, in my earlier part of my career, I didn’t want to be the stereotypical mean and nasty debt collector. That’s how I created Words that Work, because I wanted to create a communication strategy that I could teach that was all about making people feel good about paying their debt instead of making people feel like this punitive consequences and damages. The thing is it worked, and not only did it work for my industry, but it worked for every industry. That’s the workshops you’re talking about that I teach. Halelly: You said Words that Work – that’s the name of it? Mary: Words that Work is the name of the communication strategy that I developed and that is just like all about how you can manage your communication process overall. So for anybody who is in customer service, anybody who is in middle management, anytime you’re trying to train your reps to talk to other people, having this framework can just be … let me just say it like this. It can literally change everything in a business or in a department. I had one of my employees, he learned how to do this. He was just a sort of entry-level employee at my office, but he had another job and he was sort of one of those help desk people for an IT company. He used my strategy and within two years, he was promoted to a top-level executive because he kept getting the highest customer service scores. Halelly: You know we’re dying to hear about the strategy, right? Are you going to teach us some of it? I know you probably do a very long workshop to teach everything, but what can you share with us? Mary: Are you kidding me? I am happy to tell you. So, with Words at Work, there’s really just three rules and three steps. Now, when I tell you these rules, they’re going to be really simple and you’re going to think you’re doing these all the time, but I can assure you that people think they’re doing this, but when they go to really do it, it can feel a little awkward, which is the first way that you know you could improve in this area. The first rule is we have a do not say list. This is a list of words that we never, ever say in our office. The words are, “No, not, can’t, won’t, however, and unfortunately.” The reason we never say those words is because those words trigger the fight or flight system. Think about this, Halelly – when is the last time you called customer service, say maybe the cable company or the airline or credit card, and as soon as you hear them say, “No, I’m sorry, we can’t do that. Our policy is …” you notice yourself, your body dropping into these layers of frustration, do you know what I mean? Halelly: Yes. Roll my eyes. Mary: Yes, you’re rolling your eyes. You feel like, “Why can’t these people just cooperate with me?” And it’s so frustrating for us to go through this. What’s happening is, those words are triggering our nervous system and when that trigger happens, our neurochemistry begins to change. What I mean by neurochemistry, I mean the hormones created in our body. All the sudden we’re creating cortisol and adrenaline. These are the hormones that pump us up and make us want to fight and argue. The next thing you know, we’re becoming irrational people and, “I want to cancel my services with you,” and it’s just ridiculous. We’ve all had these conversations with our customers, but we’ve also been on the other side where we’ve been the customer. So imagine trying to run your business, or your department, without saying these words. It’s trickier than you think. Halelly: Well, it would be. Especially, I’m thinking “no.” Because then what are you saying yes to bad ideas or to things you can’t afford? What do you do? Mary: That is such a great question. Can I get back to that in just a second, because it’s going to answer it when I tell you the other steps. So, the second rule is you’re going to replace these negative words with what I call the words that work. The words that work are words that are going to activate the opposite of fight or flight. We all learn in science classes in high school what fight or flight is, but we don’t always learn about rest and digest. Rest and digest is the opposite. It’s the parasympathetic nervous system. It’s the feeling of nostalgia. There are reasons why companies like Harley Davidson, Zappos, Apple computers, they have all these loyal customers who are completely raving fans. But, do you ever stop to think about why do they have that? They’ve been able to create this loyal following because they have built ultimate rapport, massive connection, with their customers. And everything I teach, one of the things I often say is everything you say, everything you do, ever word that comes out of your mouth, every action you take, every choice you make in the thinnest sliced moments of life is either creating a deeper connection or it’s driving a disconnection. That’s what Words that Work is all about, is creating connection. When you use these what I call words or phrases that work, you’re actually building a deeper connection with the client or customer or even fellow coworker, employees, anybody that you’re communicating with. The way that you’re doing that is you’re actually stimulating chemicals in the body that make people feel a connection. These are things like vasopressin, oxytocin. We actually know what these chemicals are and we know the feeling they produce. Some words like that are just things like, “I want to assure you that this is going to be okay.” If you’ve ever talked to that one customer service rep on the phone and you just sort of, “Ahh.” Like you gave a sigh of relief. That is the moment where you knew you could let go of the situation. Because you actually trusted the other person. But until you trust that other person, you’re still going to be tense, so that’s rule number two. Halelly: So rule number two is to replace the no-no words with words that work. Mary: Absolutely. In fact, in the book I’m currently working on, we call this the “do not say” list and the “do say” list. So to simplify that, rule number two is really easy – you just use the words on the do say list. And then rule number three which is actually my favorite of all is always tell people what you can do instead of what you can’t do. I feel like every time I call customer service, I’m already expecting a bad result, because every time someone says a negative word to you, every time someone says, “No, not, unfortunately,” they’re reinforcing the consumer to expect a negative outcome. When you use the other phrasing, you’re planting positive seeds and you’re training their body and their brain to actually expect a positive outcome. So imagine how many times you’ve called and people just constantly tell you what they can’t do for you, and what if they just flipped that around and they told you what they could do for you instead? There’s always something they can do. Even if it’s not the thing that the customer asked for, there’s always something that can be done. So once we understand those rules, the next thing is to move onto the three steps. The very first step of that is validation. In the human brain – and all of my work is based on neurology, psychology and neurochemistry – in the human brain, I like to say that we have these checklists or boxes that have to be checked off like a grocery list. They have to be check marked before we can move onto the next step in personal communications. So one of those first steps is we need to feel like we’ve been heard. If you’ve ever been talking to someone and they tell you this really, really long story and then you’re kind of listening in but it’s not really on point so you’re trying to move them along and then the next thing you know they start the story over from the beginning. Has that ever happened to you? Mary: Well, the reason they do that is because they don’t feel validated. And so in my trainings, I’ve got a series of videos we play to really illustrate how important it is just to let someone know that you’ve heard them. You can do that as easily by saying, “I can completely see why you’re concerned about this. Let me go ahead and look into this so I can see what I can do for you.” You know, I had my own personal situation like this a few weeks ago. I called the garbage company. It was the silliest thing ever. I noticed that I pulled out of my driveway, I noticed that the garbage truck was around the corner but I had not put my bucket out. So I called the trash company as I’m dragging my bucket down my driveway and I say, “Look, the guy is right there. Can you please radio him because I don’t want him to leave the neighborhood and I don’t know if he’s already been here.” She said, “Nope, I’m sorry. We can’t do that.” And the call escalated to the point where I cancelled my services with them that day, because it was just unbelievable to me. I felt like I was asking for something really reasonable, but she was not treating me … she could be like, “Oh, I completely understand,” and then sort of figured out what my options were. But she never offered me anything. Validating is not agreeing with someone. I want to make that point. It’s not like someone is calling and complaining and you’re agreeing with that. It’s just letting them know with your words that you heard them. Mary: Absolutely. As a matter of fact, one of the videos that I play in my workshops is a Brené Brown video and it’s absolutely talking about the power of empathy. Halelly: I like that video. I know it. I’ll link to it in the show notes. It’s the one with the one animal looking into the hole and the other animal is sort of down in the hole, that one? Mary: That's it! That’s incredible. She talks about using words like “at least.” Like, “Oh, your son just flunked out of college. At least your daughter is a straight A student.” How those things actually cause disconnection, but there’s other things you can do to cause connection. It doesn't mean that you have … I think one of the things she says best in that video is rarely does a response make a situation better. What makes a situation better is connection. That first step is all about connection. And then that second step, which is an easy one – just planting those seeds of happiness by saying things like, “I am confident I can find a solution.” Of course I give people the phrases to use. Then the last step is using an action statement to tell the customers what you’re going to do. So, these are really simple. Like I said, they’re going to sound really simple, but hardly ever do I see someone actually using them. Mary: You know, I was on another show and the woman had just read a little bit about me and I think we said an excerpt out of the book and so she just read those few pages, and she actually surprised me on the show because she used the system with the client as she actually shared with me that she ended up making thousands of dollars just off this one email she wrote using my words and my steps. The a-ha moment for her was eliminating the word unfortunately. There is something that happens, because anytime you hear the word “unfortunately,” there’s just no good news. Mary: I know, and as soon as you hear it, that adrenaline, that cortisol, starts to pump through your body because you’re bracing yourself for bad news. Well, what happens, let’s say the manager or whoever is doing the speaking, when you consciously remove the word “unfortunately” from your language, what happens is it triggers the strategic thinking centers of your brain and you end up coming up with solutions that you would have never thought of before. That’s what happened in her case. She sat down to write this client an email, and actually she was going to let the client go. She called him a “vampire client,” but she was actually going to let him go. She was going to say, “Unfortunately, I don’t think I’m fitting your needs. I think you should go work with someone else.” She said instead, what she came up with was a way she could work with him by referring him to another agency. Now, I don’t know the details or the ins and outs of course, but what happened was, when she eliminated that word “unfortunately,” she was able to come up with a better solution that fit everyone’s needs. Halelly: Nice. I know there’s also something else you talk about which is the core four, and I don’t know if we have time to get into it too much, but give us a few juicy tidbits about that. Mary: The core four is something that I came up with at the beginning of this year. I can’t believe it’s already about to be fall. I’m dumbfounded by that, but I feel like I woke up yesterday morning and it was January 1. The core four came about because I was at a time in my life that I was maximized and at capacity with everything. The beginning of this year was only a few months after my book came out and I was just overwhelmed to the max. I’m sure that your listeners can resonate with a time that the demands on you outweigh the amount of hours in a day. Mary: Right. One of the things I noticed is a lot of personal development teachers will say, “We all have the same 24 hours,” and I’m like, “No we don’t. That's not true.” Yes, we all have 24 hours, but if you’re working 20 hours of them then you don’t have the same 24 hours as someone else. I was just absolutely overwhelmed and it was to the point where it was affecting my health in a pretty serious way. I sat down and thought to myself, “What are the company’s goals right now?” And I made a list of a few things. Then I realized all of the energy, I picked four core areas that needed to be worked on right now. All of the energy needed to be going through one of those core four areas. Now, if you are in management, let me give you just some examples. Maybe you’re going through a system-wide software conversion change. That’s a huge project. Maybe you’re going through hiring and you’re hiring people. Maybe you are in a season of employee reviews and you’ve just got to bang out way too many employee reviews … whatever it is. And for every single person it’s going to be different. I picked four core areas and I just made all of my strategic planning flow through the lens of those four things and I realized that if it wasn’t one of those four things, it meant I needed to get it off my plate somehow, someway. So whether that means that I need to communicate and delegate that to someone else, that might be the solution. Maybe I need to change the date of when I can work on that realistically, instead of it being in the month of August, maybe I need to put that off until January. You can kind of get the idea of it’s the workflow and an energetic shift to make sure you’re working on the highest-priority things, and being realistic about what you can do. Then you’ve got to have the willingness to go to communicate to whoever the powers may be, and I want to say about this, people will actually respect you for doing that. Mary: I think that from a corporate perspective, I’ve been on a lot of television shows and stuff where we’re talking about managing that stress in the workplace. And it can be an intimidating thing to need to ask for help. But if you do this core four process, what you’re going to find is you’ll have the data to where when you need to go to that person that you have to share this information with, you’ll be able to show them why it is this way. Halelly: And are those four priorities that are just within your job, or are they kind of life encompassing? Give me an example of what yours are. Mary: So, I’m so glad you said that, because the core four has spidered out to a whole life philosophy for us this year. I have a core four for my business, I have a core four for my brand, I have a core four for my personal life. I’ll share those with you. My core four for my personal life is healing – healing is just sort of a word for me that encompasses everything from physical to emotional, recovering from some traumas, those kinds of things. Also my children, because my children are 16 and 17, so they’re right at that age where I have a senior and a freshman in college. Really focusing on my children this year. Also, focusing on my businesses. So those are some examples. Some of the things I didn’t say was like my social life. Right now, that’s just not a priority for me. I’m not trying to be out at the dinner parties and I’m not trying to network in the way that I used to, because that’s not a priority in my life right now. Also, every department in my business has their own core four. I went to the legal department, the HR, the data entry department, the client services department, and they all have their own core four. So this one little simple concept has rippled out in it has created a lot of change, and actually it also created a ton of empowerment. Because people really got into the idea of it. They made posters. We have these giant posters around the office where people actually put up on their wall what their core four is. Halelly: Okay, great. It sounded like you were saying you do this at the beginning of the year, and you might put something off until later in the year. So I guess for how long would something that’s on the core four be on there? Is it just sort of until you finish it? Do you update this regularly or in a scheduled way? Mary: It would be until that is complete. So some things may be more ongoing. There’s a lot more to this core four. Because when you have the core four, but just to tell you the next thing, the next step in the process, would be after you create your core four, you’re going to have each one of them, you’re going to create what I call a one-page action plan for each one of those. So it’s not like a New Year’s resolution where you’re going to sit down on January 1 and you’re going to make these decisions. And it’s different from a goal because it is very goal-driven, where you’re going to ask yourself, “What are the company goals? What are my personal goals for the next two years?” Then you’re going to choose the core four in a way that these are the things that will support that outcome. For example, at my company, one of them is sales. The reason why it’s sales is because for the previous two years, we had had some heavy investment years. We invested in a new website, we invested in a new brand, and so now it was time to invest in sales so we could pay for all that stuff that we’d invested in. That became part of the core four, was sales, and also learning how to use all of that branding. Believe it or not, you have to remember to use that branding once you invest in it. Halelly: For sure. Or else it’s just money down the drain because you’re now a more beautiful best-kept secret. Mary: Right. That’s a great way to put it. Thank you. Halelly: All right, well, bummer. I want to talk to you longer, but we’re almost out of time, so Mary, before you share with us that one specific action, what’s new and exciting on your horizon? What project or discover has your attention these days? Mary: I am loving, loving, loving doing public speaking. I’m all the time being contacted by private companies and regional organizations, state organizations and national organizations. I’m getting ready to go to Florida, Nashville, Toronto and Dallas to speak all about the Words that Work communication strategy. My first book, Conscious Communications, has been super, super successful, so I’m working on a second book that’s called The Communication Code. Don’t know where that’s going to go yet, but I feel like it’s going to be an exciting time. And I just love the journey. Halelly: Yes, and you’re busy on that journey. Good for you, creating lots of helpful energy and information into the world. What’s one specific action that you can recommend that listeners take today, this afternoon, this week, to upgrade their own leadership skills or communication skills or career skills, whichever lens you want to use? Mary: I want you to challenge yourself everyday to celebrate a small win. That’s actually part of the gift that I’m giving today, but the reason I want you to do this is because, especially women, we don’t take time to celebrate our wins in life. From a neurology perspective, what happens when you celebrate your small wins is that it actually helps develop the strategic thinking centers of your brain even more. If you take time to say, “You know, I did a great job today. I got this project finished or I sent out that email that I’ve been hesitating to send, or I had this conversation or maybe even just got your bank statement balanced.” Taking that time everyday to celebrate those small wins can actually help you get more on point with your strategic thinking. Halelly: Okay, celebrate small wins. That’s very actionable. Mary, it’s been a pleasure speaking with you, and I’m really glad you took some time to share insights with the TalentGrowers. Where can they learn more about you and stay in touch and learn more from you? Mary: My big ask is if you resonated with what we talked about today, please go on Amazon or wherever is your favorite place to buy books and look up the book Conscious Communications, your step by step guide to harnessing the power of your words to change your mind, your choices and your life. And I always say if you read the description and a handful of reviews, you’ll know right away if this is the book for you or not. You can connect with my personally through my website, which is MaryShores.com. I absolutely am in love with LinkedIn these days, so if you have a LinkedIn account – just Mary Shores, find me, send me a request. I’d be happy to accept it. And I also have a Facebook group called Fearless Ambition and you can certainly join that as well if you want some daily Mary Shores interaction. Halelly: Great. I’ll link to all of that, including the book, in the show notes. You mentioned a gift earlier – what do you mean? Mary: Right now I’m very excited that we’re sharing with you, I kind of call this my superpower manifestation tool. It’s called the Daily Desires Diary bundle. What it is, it’s a daily journal exercise where you’re going to download this journal page and it’s got three prompts. One is about gratitude, one is about sharing your daily win and the other is stating things you desire. If we had time I would go into all of the neurological research as to why this works to help you manifest things and cause a massive amount of synchronicities in your life. Along with that, you also get a download of the first chapter of Conscious Communications. It’s a great way to check out the book too. Halelly: Cool, all right. You’ll give me a link and I’ll put that on the show notes page, then? Halelly: Great. We love gifts. Thank you so much Mary. I appreciate the gift and I appreciate your time and insights and thanks for sharing those with us today. Halelly: This is the back of the podcast club. That’s a funny name that David Burkes gave it. If you made it this far, thanks for listening and thinking about action, and now of course it’s time to take action. I hope that you’ll go do it. But I also hope that you’ll report back to me, because here I man, speaking to the ether. I don’t know if you found it valuable. I don’t know if you’ve tried taking action. I don’t know how it worked, and I am dying to know. So, let me know! You know that you can reach me in a million different ways and that will make it so much more meaningful for me to hear back from you. But also, I want to know, what will help you further? What topics and guests you want me to focus on in the future, so that I can continue to serve you. I also serve you by creating a free guide that I put on my website. You can download that absolutely free. It’s on the podcast show notes page, and it’s called 10 Mistakes that Leaders Make and How to Avoid Them. I know you don’t want to be making those mistakes, but they’re actually pretty common. In this guide I actually break it down to specifically what’s a mistake about it and how to overcome it – what should you be doing instead? So, download that and then of course we’ll be able to stay in touch via my weekly newsletter which is fun, informative and I think very useful. I look forward to that, and until the next time, this has been another episode of the TalentGrow Show and I am your host, Halelly Azulay, your leadership development strategist here at TalentGrow, where we develop leaders that people actually want to follow, and I hope that you make today great.